Andrew Harling braves the Mini Beast from the East along Bispham cliff top. The “Mini Beast from the East” put paid to several more local races than its elder did two weeks ago, with the cancellation of the Wilmslow and Wigan Half Marathons and the Thirsk 10 in Yorkshire. The Lincoln 10k, selection race for the England Athletics Masters Age Group team was also called off, leaving only Chichester with a result for the selection after cancellation of the Trafford 10k three weeks ago. 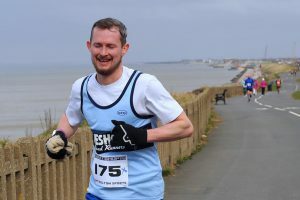 The Sweatshop 10-mile race in Bispham went ahead successfully despite weather warnings but the conditions were fine on the Fylde coast if cold and threatening snow. However, the numbers competing was depleted as competitors from the east could either not travel or chose not to risk it. However, there was no reason to call the race off and there was a good local contingent, sporting a fine array of woolly hats and buffs with the winning times (56:21 for the men and 68:23) perhaps affected by the cold conditions. There was a good turnout from Wesham members, with David Taylor running 61:38 for 6th place. Andrew Harling was 20th and 7th M35 in 69:35 and Mark Renshall was 28th with 1:13:21 for 6th M40. Lee Nixon finished 33rd in 1:14:08. The men’s team finished 3rd behind Red Rose (2nd) and Preston. Gemma Owen was Wesham’s first woman finisher in 5th place with 1:14:39 and 36th overall, also 2nd W35. Kath Hoyer was 6th W55 and 16th woman in 1:21:49, 71st overall. Alan Hudson finished 1st M65 in 1:19:20 in 53rd place overall; Martin Bates was 3rd M60 and 55th in 1:19:22, very close behind. Rob Wallace finished 56th in 1:19:42, and Phil Leaver was 5th M60 in 1:21:41 and 69th overall in more favourable conditions than the Rhyl 10 3 weeks ago. Paul Carter finished 99th in 1:29:38, 13th M45, and Alistair Morris was 8th M55 and 116th overall. Gemma was 1st woman in the Fire Service Championships; Alan Hudson was 8th in the incorporated Northern Masters Championship with Martin Bates 9th and 2nd M60 behind Fylde ace Paul Muller. Phil Leaver was 11th in the championship and 3rd M60. The Wesham M60s were the only team to finish. This unfortunately will be the last 10-mile in this series that began in St Annes 30 years ago, the end of an historic race. All credit to the Race Director Dave Waywell for his services over all these years and it will be sorely missed. The British Masters’ Cross-Country Championships was held in Forres, Morayshire near Inverness on Saturday. Over a 2-lap 8km course featuring half-and-half parkland and upland woodland with a short killer climb named “Horrible Hill” there was a counter-balancing technical descent which Alex Rowe used to his advantage in the M35 to 64 race and he finished 7th M60 and 78th clocking 35:21. Poulton resident Phil Leybourne had a steaming run finishing 3rd M50 in 28:53 just 18 seconds behind the M50 winner and he was 12th overall in the race and taking Salford Harriers to the bronze team medals. The “Mini Beast from the East” was a shadow of what it was in the South, with very pleasant sunshine although a stiff cold easterly wind. Simon Denye ran the Trimpell 20 on Sunday and he finished 171st and 21st M40 in 2:50:15, Ben Wrigley came in 224th with 2:58:53, a commendable performance on a tough wintry day. Dave Young finished 1st M70 and 296th overall in 3:12:55 and David Millar 369th with 3:30:57. This was a popular race placed just right for athletes training for an April marathon and there were 517 finishers. Wesham members were out and about at various parkruns on Saturday morning despite the chilly conditions. At Lytham Hall David Taylor had the fastest time of the morning with 17:41 to record a new personal best for the course with an age graded performance percentage of 73.33%. Ben Wrigley ran a swift 22:53 for M35 grade of 58.34%, and Sharon Cooper ran 23:34 for W40 66.76%, both runners edging towards their personal best performances. Kerry Eccles had 28:25 for W55 63.70 and Debbie Bell made a return with 45:17 for W40 34.74% on a tail-runner duty. Similarly, at the Preston run Rob Danson ran the fastest time of the day with 17:40 for a 73.02% grade. Steve Myerscough was hampered with a calf strain and he cautiously ran 23:26 for M40 60.03%. Robert Brown clocked 25:44 for M60 62.31% with Andrew Moore running 28:23 for M55 54.61%. Nigel Shepherd made a tentative return with a time of 28:28 for M55 55.85%. Chris Pike added another run at St Helens to his tally, with 25:47 for M40 54.17%, a big improvement on last week. Graham Cunliffe was on his travels and pitched up in Conwy North Wales with 27:36 for a new personal best here of 58.64% for an M60. There was another top placing for Wesham in the Blackpool parkrun with Steve Waterhouse running the day’s fastest time of 18:30 for M45 79.10%, with James Mulvany second fastest also stopping the clock at 18:30 for an M40 grade of 73.78%. Lee Barlow ran 18:42, a tremendous run from the M45 for a grade of 76.38%. Dave Marsland clocked 23:20 for M60 70.43%; Sara Ward had 24:48 and a W50 69.29% grade. Kay Twist ran 27:01 for W45 60.58%; and Stephen Twist 27:35 and M50 53.90%. The parkrun tourists the Gores were at Crewe this week; all running as a family group Megan scored 34:43 for JW11 47.91% with Steven running the same time and Vicky a couple of seconds behind with 34:45.